President Donald Trump on Wednesday explained via Twitter his reasons for congratulating Russian President Vladimir Putin on winning reelection. The Washington Post reported Tuesday night that Trump's briefing materials instructed him not to congratulate Putin, who won reelection on Sunday, when the two talked on the phone. It is unclear whether Trump saw the note telling him not to do so. 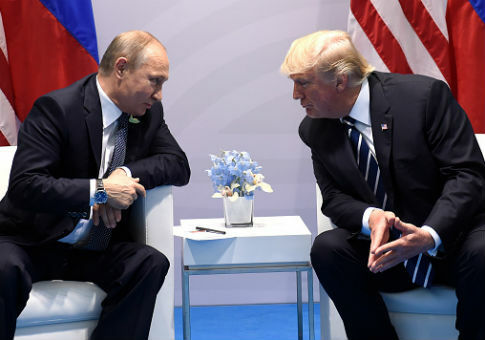 While many observers in politics and the media consider the Russian election a sham, Trump said he called specifically to congratulate Putin, and he emphasized the importance of maintaining good relations with Moscow. "I called President Putin of Russia to congratulate him on his election victory (in past, Obama called him also)," Trump tweeted. "The Fake News Media is crazed because they wanted me to excoriate him. They are wrong! Getting along with Russia (and others) is a good thing, not a bad thing." Trump said cooperating with Russian could help U.S. interests around the world, adding that past administrations failed to do enough to get along with Russia. "They can help solve problems with North Korea, Syria, Ukraine, ISIS, Iran and even the coming Arms Race," Trump continued in a second tweet. "Bush tried to get along, but didn't have the ‘smarts.' Obama and Clinton tried, but didn't have the energy or chemistry (remember RESET). PEACE THROUGH STRENGTH!" …..They can help solve problems with North Korea, Syria, Ukraine, ISIS, Iran and even the coming Arms Race. Bush tried to get along, but didn’t have the "smarts." Obama and Clinton tried, but didn’t have the energy or chemistry (remember RESET). PEACE THROUGH STRENGTH! The State Department said Tuesday that Russia's election was not fair but that Trump's call was "protocol." The controversy over Trump's call comes as military tensions with Russia have risen in recent months. Last month, Kremlin-backed mercenaries were killed in a U.S. airstrike, which the U.S. maintains was done in self-defense against an attacking pro-Assad regime force. The investigations into Russian interference in the 2016 U.S. presidential election are also ongoing. Many in the Democratic Party and the media have charged that Trump has obstructed justice to cover up contacts with the Russians, leading Trump to call the investigations "a witch hunt." Putin has dismissed the charge that the Russian government did anything to interfere in the election. He has also denied involvement in the attempted assassination of a former Russian intelligence officer in the U.K., which Trump said Russia was likely behind. This entry was posted in Politics and tagged Donald Trump, Russia, Vladimir Putin. Bookmark the permalink.